January 1946: London is emerging from the shadow of the Second World War, and writer Juliet Ashton is looking for her next book subject. Who could imagine that she would find it in a letter from a man she’s never met, a native of the island of Guernsey, who has come across her name written inside a book by Charles Lamb? As Juliet and her new correspondent exchange letters, Juliet is drawn into the world of this man and his friends—and what a wonderfully eccentric world it is. 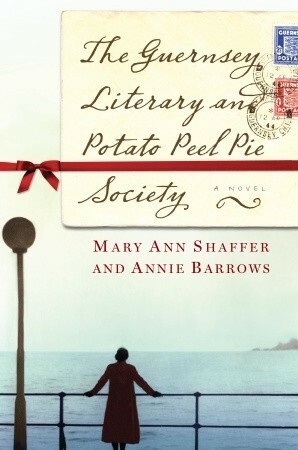 The Guernsey Literary and Potato Peel Pie Society—born as a spur-of-the-moment alibi when its members were discovered breaking curfew by the Germans occupying their island—boasts a cast of characters, from pig farmers to phrenologists, literature lovers all. This is such a feel-good, heartwarming little book, and I feel it cropped up on my reading list just at the right moment. I love books written in the form of letters, and I love books about wartime. This book is written in an epistolary format which takes the form of letters written to our protagonist, Juliet, and her responses. It focuses on the aftermath of WWII, where people are trying to rebuild their lives after the darkness and devastation that occurred. The letters themselves lend a touch of rapport with the characters almost immediately. As Shaffer chooses to include letters to and from a host of different people, the book has an ubiquitous eye into each individual relationship. We can see what is being said to some, and not to others, and are also tuned into gossip, and each character's opinions of the others. Juliet was my favourite character by fair; she had a delightful streak of wit, independence and feminism to her approach and writing. Her letters to friends read almost like innermost thoughts as she paints the pages with her feelings and worries. I particularly enjoyed her utter disgust at being described as sunny and carefree; she interpreted this as being thought empty-headed. I had to laugh; this is exactly the type of assumption I would make. One other character deserves a mention here; Elizabeth. We never meet her, as she's long gone from Guernsey by the time Juliet begins her correspondence. Despite her absence, the strength of her character comes through in the words and memories of the others; her strength, tenacity, and complete heart of gold shines through the pages. I don't doubt there were women such as Elizabeth during the war who would give everything up for the benefit of others. These women would have helped win the war, and a thought of kind humans is one to hold on to. Most of all, it was important to learn of life in Guernsey during the German Occupation. Although this novel is more light-hearted than not, Shaffer didn't shy away from exposing the heartbreak and turmoil the islanders experienced once the Germans took over. Some of the characters' stories are utterly painful, and it's particularly eye-opening as no where else in Britain was occupied. We're shown how humanity can cobble together to make the best of a bad place; it's truly heartfelt and inspirational. We are treated to a happy ending, and although I'm not usually one to appreciate these (thanks, Bill Shakespeare), I found the joy very much needed, and highly satisfying. It did happen quickly, and I felt the novel ended abruptly, however I don't have much to gripe about. I'm now desperate to see Guernsey; it sounds wonderful.